It was developed in just 30 days in the summer of 1942 by the Subsistence Research Laboratory in Chicago. And never in its 52-year history has it been known to break, rust, need sharpening or polishing. 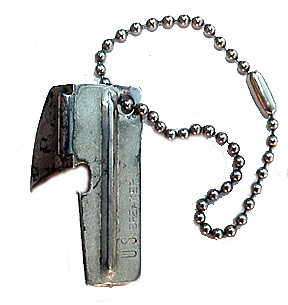 Perhaps that is why many soldiers, past and present, regard the P-38 C-ration can opener as the Army’s best invention. C-rations have long since been replaced with the more convenient Meals, Ready to Eat, but the fame of the P-38 persists, thanks to the many uses stemming from the unique blend of ingenuity and creativity all soldiers seem to have. The most vital use of the P-38, however, is the very mission it was designed for, said Fort Monmouth, N.J., garrison commander Col. Paul Baerman. When Bandola attached his first and only P-38 to his key ring a half century ago, it accompanied him to Anzio, Salerno and through northern Italy. It was with him when World War II ended, and it’s with him now. Sgt. Ted Paquet, swing shift supervisor in the Fort Monmouth Provost Marshal’s Office, was a 17-year-old seaman serving aboard the amphibious assault ship USS New Orleans during the Vietnam war when he got his first P-38. The ship’s mission was to transport Marines off the coast of Da Nang. On occasional evenings, Marines gathered near Paquet’s duty position on the fantail for simple pleasures like “Cokes, cigarettes, conversation and C-rations.” It was during one of these nightly sessions that Paquet came in contact with the P-38, or “John Wayne” as it’s referred to in the Navy. Paquet still carries his P-38, and he still finds it useful. While driving with his older brother, Paul, their car’s carburetor began to have problems. Paquet”s P-38 is in a special box with his dog tags, a .50-caliber round from the ship he served on, his Vietnam Service Medal, South Vietnamese money and a surrender leaflet from Operation Desert Storm provided by a nephew. “It will probably be on my dresser until the day I die,” Paquet said. The feelings veterans have for the P-38 aren’t hard to understand, according to 1st Sgt. Steve Wilson of the Chaplain Center and School at Fort Monmouth.